12/07/18 THE SCOTTISH OPEN' GULLANE GOLF CLUB - GULLANE' The USA's Phil Mickelson at the 1st . Phil Mickelson broke his silence after playing his opening round in the Aberdeen Standard Investments Scottish Open at Gullane, admitting his actions during last month’s US Open was the “worst” instance of a series of “dumb stuff” in his career. The five-time major winner had politely declined a request to talk to the media in the builld up to this week’s $7 million Rolex Series event but spent nearly 10 minutes chatting to reporters after opening with a level-par 70. “I am not going to talk about today’s round. 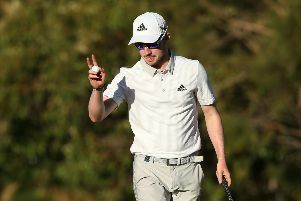 However, I am more than happy to talk about what happened at the US Open a month ago,” he said after explaining that visits to Carnoustie and also the Ryder Cup course in France had been behind his traditional appearance in the media centre earlier in the week. That, of course, was reference to him having intentionally hitting a moving ball on the 13th green in the third round at Shinnecock Hills, incurruring a two-shot penalty in the process. He said straight afterwards that his actions had almost been premeditated, having been on the brink of doing something similar in the past. In the final round, which many thought he shouldn’t have been involved in as the USGA had an option to disqualify him, Mickelson then produced a mock celebration after holing a putt on the same green. Both Rory McIlroy and Tom Watson came out and defended Mickelson, with the former saying the reaction to the incident had been over the top. Did Mickelson agree? “The thing about this is throughout my career, 25 years, there have been a lot of times where I have had to be accountable for decisions I did not make. And the reason why this has actually been easier, it was my own fault,” he said. “So the articles and the backlash is my own fault. So it’s much easier to deal with than some of the times where I have not been involved in the decisions and had to deal with that. “You know, you have to be accountable for yourself. I do a lot of dumb stuff, right. I remember, you know, I had that rules deal at Greenbrier last week, right. Well, last year at Greenbrier, I picked up my ball in the middle of the fairway, marked it and cleaned it. “I have these like just moments where I, like in a cloud, if you will, I’m not really sure what I’m doing or I’m just kind of going through the motions and not really aware at the moment, and I’ve done that a bunch in my career. “I’ve picked up the ball and marked it and cleaned it, probably four or five times after the first couple days was lift, clean and place and I kept doing it. I keep doing stuff like that. That’s the way my mind works. Almost a month on, Mickelson has changed his change about what happened being a calculated decision. “Not only was I not great on the course, I was not great after the round, either,” he added. “So it was just not a great day, and it was my birthday. So I tend to do dumb stuff on my birthday, too. Earlier, Mickelson had received a warm welcome on the first tee as launched his bid to regain a title he won at Castle Stuart in 2013 then became Open champion at Muirfield the following week.